Looking for a sweet treat to make your valentine? These apple turnovers MaMa made are great cookies...yes, I know, MaMa keeps telling me they aren't cookies, but I like calling them cookies. 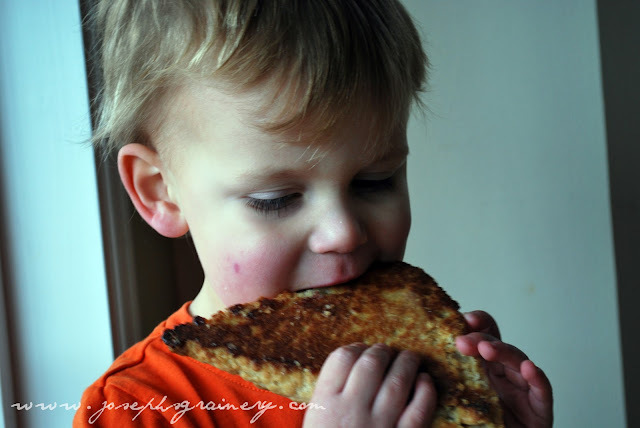 MaMa found this recipe at Annie's Eats and "whole grain-ified" it. Directions: To make the puff pastry, combine the flour, sugar and salt in the bowl of a food processor fitted with the metal blade; pulse to combine. Add in about a quarter of the butter cubes and process until the butter is in dime-sized pieces, about four 1-second pulses. Add the remaining butter and process to coat the cubes with flour, about two 1-second pulses. Transfer the mixture to a medium size mixing bowl. Combine the ice water and lemon juice in a small bowl. Add half of the liquid to the flour and butter mixture, and toss just until combined. Keep adding the liquid, 1 tablespoon at a time, until the dough will clump together with your hand. Turn the dough out onto a work surface. The dough will be dry and shaggy at this point. To fraisage the dough, brace the heel of one hand against the work surface and dragging small portions of the dough forward in short, brisk strokes. Gather the dough together into a rough mound, using a bench scraper if necessary. Repeat the fraisage a second time. Press the dough into an 8- by 4-inch rectangle, wrap in plastic, and refrigerate for 1 hour. Place the dough onto a lightly floured large piece of parchment paper and roll into a 15- by 10-inch rectangle. Fold the dough lengthwise into thirds. Starting from the narrow end, loosely roll up the dough into a coil. Press it to form a 6- by 5-inch rectangle. Repeat the rolling and folding process once more. Roll the dough out into a 15- by 10-inch rectangle. (If at any point in the rolling and folding process the dough becomes too sticky or difficult to work with, transfer it to a baking sheet or cutting board, cover withplastic wrap, and refrigerate until it becomes workable.) Fold lengthwise into thirds. 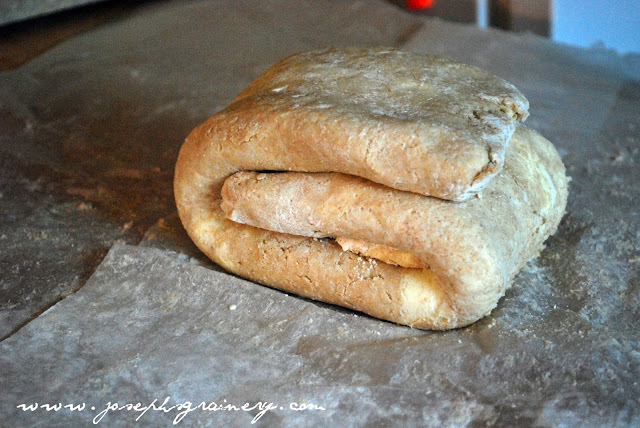 Starting from the narrow end, loosely roll up the dough into a coil. Press it to form a 6- by 5-inch rectangle. Wrap in plastic wrap and chill for at least 1 hour. Roll the dough into a 20- by 15-inch rectangle, about 1/8-inch thick. Line 2 baking sheets with parchment paper, trim and cut the dough into twelve 5-inch squares, and place 6 on each sheet. (If they aren't all perfect squares, it is okay - you can cover it up once you fold them over.) Refrigerate the dough squares while you make the filling. To make the filling, peel the apples and grate them on the holes of a large box grater (I used my food processor with the shredding disc.) 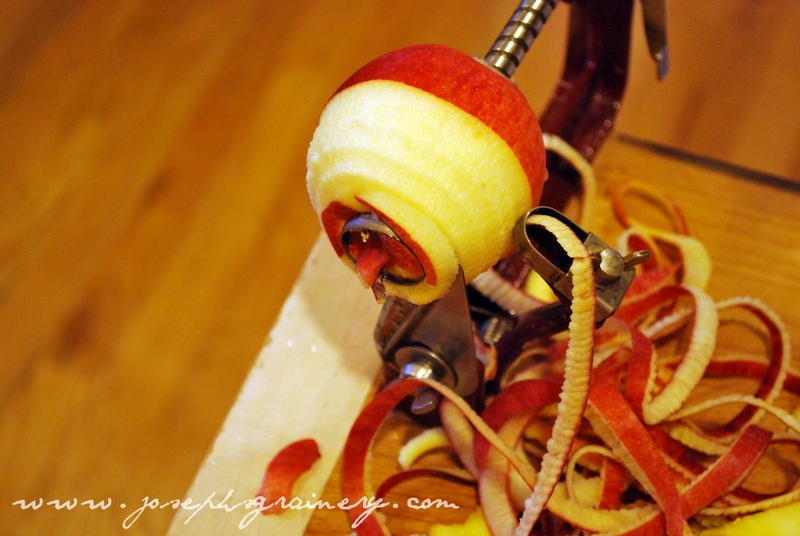 Combine the grated apples, sugar, lemon juice and salt in a medium bowl. Remove one sheet of the dough squares from the refrigerator. Working with one square at a time, place 2 tablespoons of the apple filling (squeezed of excess liquid) in the center of the dough. That's my Great Grandma's apple peeler-corer...it's a pretty handy contraption. MaMa let's me turn the handle! Moisten two adjoining edges of the dough square with a finger dipped in the apple liquid, then fold the top portion of dough over the bottom, making sure to overlap the bottom portion by 1/8-inch. Crimp the edges of the turnover with a fork. Repeat with the remaining dough squares. Return the sheet of turnovers to the fridge and repeat with the second sheet of dough squares. Refrigerate the filled turnovers 30 minutes. While the turnovers are chilling, preheat the oven to 375° F. Combine the sugar and cinnamon in a small bowl and stir together until mixed well. Brush or mist the turnovers lightly with water and sprinkle evenly with the cinnamon-sugar mixture. Bake until golden brown, 30-35 minutes. Using a wide metal spatula, transfer the turnovers to a wire rack to cool. Serve warm or at room temperature. Yes, I thoroughly enjoyed every bite and yes, I need a haircut, but I won't let MaMa near me with a pair of scissors. 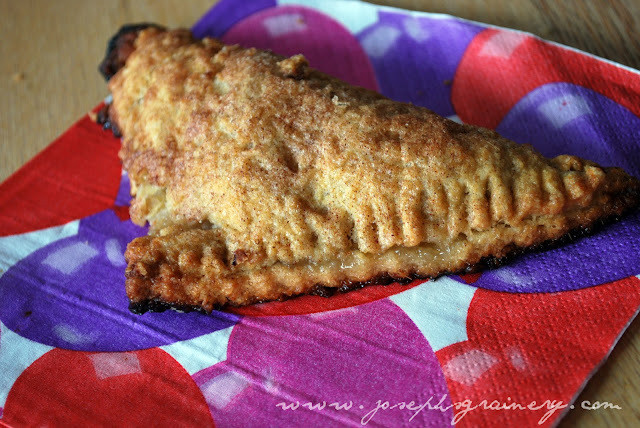 Thanks again to Annie's Eats for the inspiration to try a whole grain version of her Flaky Apple Turnovers!